“Holy Tilda Swinton!” These three words—proclaimed in the sci-fi series Orphan Black (2014-) to describe the arrival of a transmasculine clone—articulate the cinematic gift that is our most mercurial, protean actor: Katherine Matilda Swinton. At home in the sci-fi genre, Swinton’s grace is in her transformations, especially those of gender. Whether she is narrating Björk (as she does in the concert documentary Biophilia), or embodying Bowie in the video for “The Stars (Are Out Tonight),” Swinton is constantly on the cutting-edge of pop culture, always taking on the role of grace in gesture, genre, and gender. The exclamatory quip in Orphan Black is a salute to an actor whose radical self-transformations between and within films could very well have inspired the show’s multiple clones: in Lynn Hershman Leeson’s Teknolust (2002) Swinton played not one, not two, but three clones. In this film, the clones live in a microwave, going out at night to gather sperm while the government hunts down the scientist who made them. Bizarre, yes. But in the hands of the multiple Swintons, all of this makes perfect sense. Swinton is often able to make sense where others cannot, and she fuses the bizarre with the serene. Take, for instance, her role as Friendship, an alien robot who lands in Amman, Jordan, during Black September in Peter Wollen’s space oddity Friendship’s Death (1987). Friendship claims solidarity with the typewriter on which her host, a journalist, bashes out his articles, in a rousing speech about human’s enslavement of machines. Swinton needs none of the nanoo-nanoo quirks actors usually employ to humanize a non-human agent. Instead, she wields erudition and elegance to set herself apart. As the patron saint of outsiders, Swinton is the hero to the awkward squad: the angular, the unpopular, the too-clever. The ones who have to question everything. 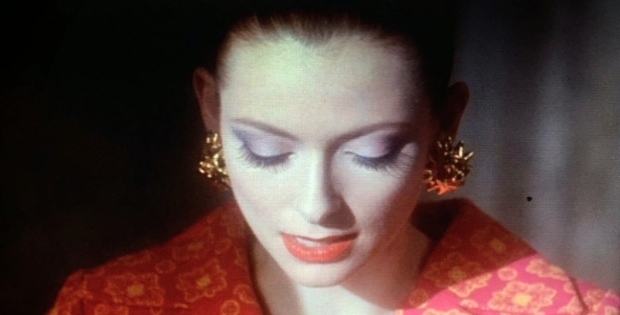 Just look at her work in the radical romps of her long-time collaborator Derek Jarman, where she is equally at home playing a Queen among queens in Edward II (1991); a murderous artist’s model in Caravaggio (1986); and the dispossessed punk spirit of the age and nation in The Last of England (1987). Though many of Swinton’s performances operate in the art-house margins of cinema, she isn’t limited to this niche: Swinton was nominated for the Academy Award for Best Supporting Actress for playing lawyer Karen Crowder in Michael Clayton (2007). In the operatic central scene, Karen prepares for court. Like a medieval king preparing for battle, Karen lays out her outfit—her courtroom armour—on an anonymous hotel room bed, emphasizing the weird masculinist androgyny of women’s business wear. Of course, Crowder is punished for aspiring to enter the men’s room. She is characterized as soulless, awkward, and empty in contrast with the charismatic Clayton (George Clooney). It’s a common fate for Swinton in the mainstream: the same traits that make her a celebrated performer also make her a good villain. Whether she is playing the monstrous mother figure in The Beach (2000), or the White Witch in The Lion, the Witch and the Wardrobe (2005), when Swinton unleashes her powers outside the arthouse, they are for evil. Her magical ability to transform is itself transformative, as it casts gender, class, and even age (see: Swinton as a comical crone in 2014’s The Grand Budapest Hotel) as disturbingly unstable. It’s a resistance to categories that can only be sentenced to downfall and containment, as in Michael Clayton where Clooney literally causes her to collapse and deflate. What compels viewers (and terrifies dominant culture) is Swinton’s embodiment of that reckless, unboundaried possibility more commonly associated with masculinity and male performers, but which she conveys as feminine. Whereas Hollywood harps on the narrow frame of the “strong female character,” Swinton plays vulnerability as devastating power in Julia (2008), in which she portrays an alcoholic who accidentally becomes a kidnapper and then an adoptive mother. And in Young Adam (2003), she conveys the domestic urge as devastating desire, embodying the protagonist’s wild and possessive former lover. At every turn, she undermines the conventional role of daughter/wife/mother. Often brandishing her pallor of skin as a butoh-like mask, she draws attention to the persistent conceit that the female performer is simultaneously a blank surface for projection and a doll-puppet smiling at will. Her pallid anomie as a vampire in Only Lovers Left Alive (2013) is the exact inverse of her “tandoori tan” (Swinton’s words to Lesley Coffin at The Mary Sue) and perma-grin in Trainwreck (2015). 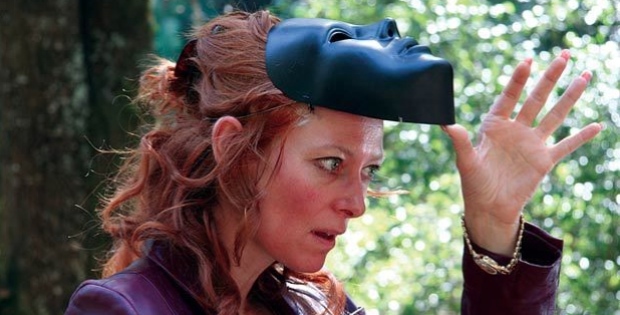 She wears masks—which, as every Swinton performance shows, can slip. Resolutely secular, Swinton’s grace cuts through the dis-grace of dominant culture’s social pretences, refusing conventions and boundaries, insistently questioning with the directness of her gaze. Speaking candidly to the media about what they label her “unconventional” personal life—which includes starting a Steiner school for local children, writing passionately about Derek Jarman, penning a poem for “honesty bomb” Amy Schumer, advocating for independent cinema through her esoteric travelling film festival—Swinton also strips the veil from celebrity and abandons the actress’ pedestal. 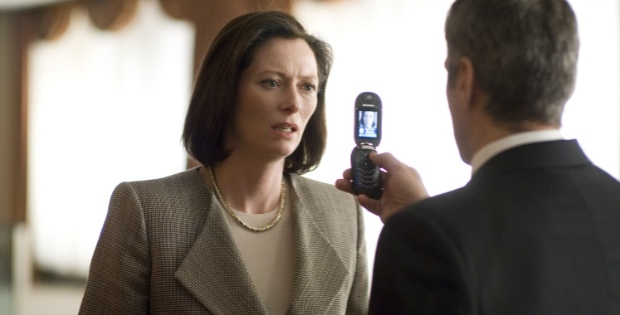 In the scenes where Karen rehearses her court speeches in Michael Clayton, Swinton refuses the enchantment of performance, revealing the sweaty, physical labour of getting into character. And yet we are still, critically, enchanted—even as that sharp gaze catches us in the act of falling in love with her. How does her look move through the screen like that? In Orlando, famously, she looks and speaks to camera, creating what shifts between complicity and intimacy until, when she whispers that she’s never felt better in her life and thinks she’s going to faint, she creates a sisterly intimacy with the audience reminiscent of Jane Austen novels. But across her compendious body of work, it is her bodily presence—led by those astonishing eyes—that encounters us, again and again. Swinton has modelled for Haider Ackermann, but she has also written for experimental film magazine Vertigo. It’s not that she brooks no contradiction. She embodies contradiction and pushes us to do the same, to be all the clones in one flesh. As for holy, Cornelia Parker placed the performer (at her insistence) in a vitrine at the Serpentine Gallery in London in 1995, a performance Swinton restaged on her own initiative at MoMA in 2013. In its first iteration, Swinton spent eight hours a day for a week sleeping—or lying supine with her eyes closed—in a glass case slightly higher than a bed. 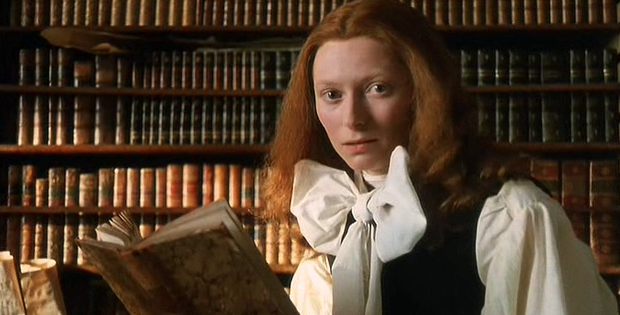 Prefiguring the Sleeping Beauties of Catherine Breillat, Julia Leigh and Ulrike Ottinger, Swinton’s sleeper awoke us from our dreams—of class and ownership, of colonial plunder, of gender and vulnerability. She rested her gaze and still saw deep into our psyches. By simply laying still beneath our eyes, Swinton transformed what it means to be visible into a disquieting investigation of prurience and limitless desire. She inverted the entire premise of cinema right under our noses and resurrected it through her restless, ever-presence as flesh. Swinton’s is the body that beams through the screen to give us grace. 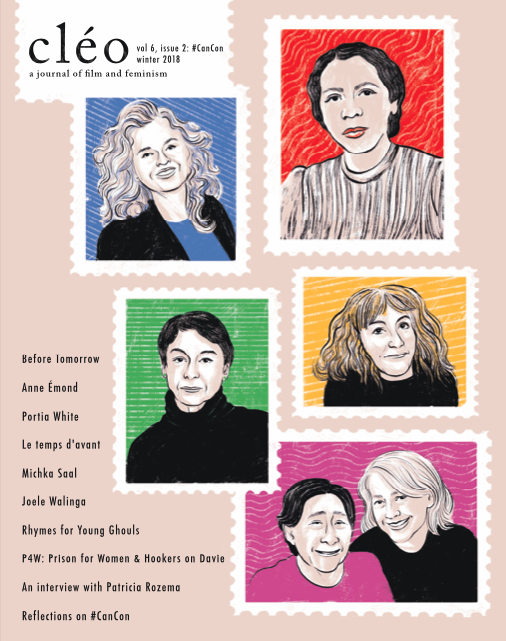 So Mayer is a full-time feminist film activist, working with queer feminist curators Club des Femmes and industry campaigners Raising Films.